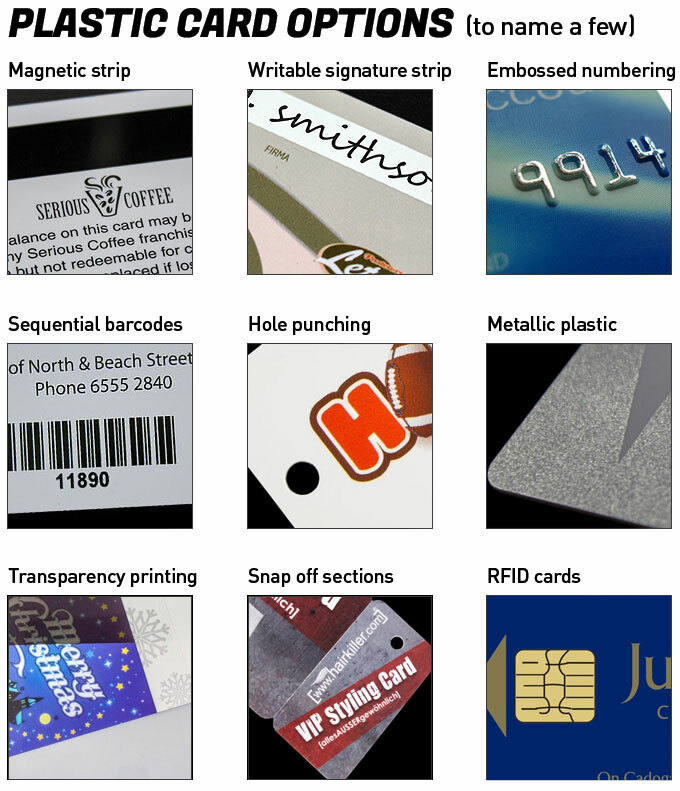 Behold our range of plastic card printing options. We offer any size, shape or variety of colours you can dream of, because getting people correctly identified at an event doesn't need to be boring and plain! and giving customer loyalty cards that look awesome is far better for business than giving out plain boring credit card style gift cards. There are numerous different printed plastic cards here to choose from. There is our standard printed membership cards, custom shaped cards, transparent options, snap combo membership cards and more. Each one of these printed plastic cards are completely customisable. All of our plastic cards are designed to perfectly compliment our range of lanyards, both printed lanyards and our overnight in stock range. Browse those categories we also have an express store for ordering online with same day dispatch. Plastic card printing has transformed the way people live. Many individuals no longer carry cash, as they have a bank card in their pocket. A driver's license is now a plastic card, and many people show proof of insurance via a card of this type. These are only a few of the many ways in which these cards have taken over, and there are countless others. A business can also opt to provide customers with a plastic loyalty card, allowing clients to build frequent buyer points that can be used for free or discounted items. Finding the right card for each situation isn't difficult, as there are numerous options available all you need to do is browse our range of give us a call and we can assist. Plastic cards are usually sized to fit in an individual's wallet or on their key chain, ensuring they can be easily accessed when needed. The cards hold up with time and frequent use, helping to keep replacement costs to a minimum, and they can be used for different purposes within an organisation. When combined with other marketing materials, the cards reinforce the brand in the consumer's mind and help to increase brand loyalty. As they are inexpensive when compared to many other options, businesses often find the cards are the solution they have been searching for. In addition to the previously mentioned uses, plastic cards serve a useful purpose in many other areas. Create a membership card or offer promotional luggage tags to customers, complete with the business name and information. Use event passes to regulate your event visitors and even use thick colour printing to ensure crowds can be seperated into access levels. Plastic cards offer an alternative to traditional business cards and can be of great help to those who need to restrict access to specific areas, as they can provide these cards only to those employees with the necessary clearance. Fundraising is easy when these cards are used, as the purchaser carries the card in their wallet, show it at a participating business and receive the discount. Furthermore, they make an excellent novelty gift for any purpose. Many businesses will order blank plastic business cards from us and choose to use their own print machine. However when we handle everything for you from artwork to production why would you need to waste time with plastic card printers? Clients and patients often lose appointment cards, but this isn't an issue when a plastic card is used. They carry this card in their wallet and it can be updated with new appointment information at every visit. This is of great help to those who need to see a professional regularly, and the card can be combined with another program, such as a loyalty program at a hair salon. Season passes and cloakroom cards are two more ways these cards might be of help to a business or organisation, as the cards can be reused year after year or provided to customers and returned at the end of the event. Who Benefits From The Use Of Plastic Cards? Businesses aren't the only ones who find these cards are of great benefit. Individuals may choose to purchase them for an event or function, non-profit organisations often opt for this option when creating membership cards, educational institutions use them to identify students and more. The ideas are endless when people stop and think about how convenient it is to carry one of these cards around, especially those that fit on a key chain. This helps to explain why many stores now offer cards of this type to their customers, and the customer appreciates this, as they obtain perks available only to those in possession of the card. As everyone likes saving money, people will be rushing to obtain these items. People often assume plastic is bad when compared to paper, yet this isn't necessarily the case. For example, paper production is a known source of air pollution, and the manufacturing of paper can emit 80 percent more greenhouse gases. This doesn't even take into account the impact tree removal has on the environment. Trees absorb carbon dioxide, and each one cut down for the making of paper removes this natural filter for the air humans breathe. Paper manufacturing uses an excessive amount of water, which is not the case with plastic, and recycling paper can be an inefficient process. Businesses can express their concern for the environment and its impact on the planet by making the switch to plastic business cards when possible. Consumers often purchase products with the environment in mind, and the plastic card clearly demonstrates an improvement over throwaway cards. Customers aren't limited to one or two choices when it comes to our high quality plastic cards. Some opt for printed plastic id cards, yet others want a custom shape for their offering. Translucent options are available, along with snap combo membership cards, and custom luggage tags and plastic membership key tags are also provided. Regardless of which option is selected, the card is completely customisable, allowing customers to choose the design and colours, the text and images and more. Plastic cards help to present a business or organisation in a professional light. Furthermore, they can be used to provide more information about the business, not only in terms of contact information, but also insight into the values of the organisation or business. For those groups looking to branch out and market in a new way, plastic cards are a great way to do so, and they are useful in numerous other areas also. Be sure to check them out.